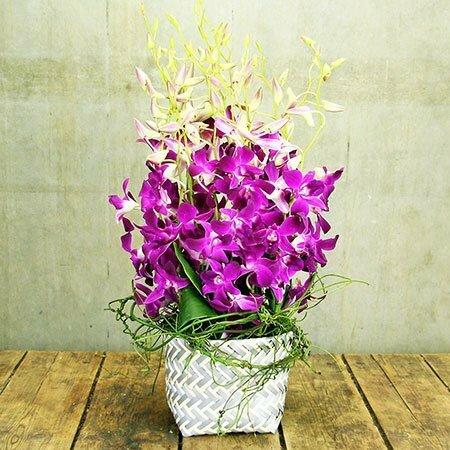 Send our lush orchid flower basket perfect for any occasion! These divine purple Singapore orchids in our groovy chevron-look basket are ideal for celebrating birthdays or the birth of a new baby, and are great for cheering someone up or to say `get well soon`. Send as they are or team with one of our additional gift options, such as a fresh fruit box, bottle of bubbly, chocolate, Ecoya candle or bright balloon. *PLEASE NOTE: The pictured basket and presentation is exclusive to flower delivery in the SYDNEY METRO ONLY. Do you wish to send orchids outside the Sydney metro? Not a problem. Give us a call on 1800 66 66 46 or email sales@flowersforeveryone.com.au and our floral consultants will provide a quote and suggestions based on availability in the location you are delivering to.